1. Put the muscovado sugar and bourbon in a saucepan just big enough to hold the dates in a single layer. Set over a medium heat and stir to dissolve the sugar. Boil for 1 minute then add the dates, turning to coat. Take off the heat and set aside. 2. Preheat the oven to 170˚C, gas mark 3, and put a large baking tray on the middle shelf. Unroll the pastry onto a lightly floured surface. You need to make it into an almost-square sheet big enough to line a deep 23cm tart tin, so roll it out slightly, then cut a strip from one edge and press it onto an adjacent edge to make a square. Use to line a deep 23cm loose-bottomed tart tin. Trim off the excess; chill until needed. 3. Put the butter in a mixing bowl with the caster sugar; beat with a wooden spoon until fluffy and light. Beat in the eggs, one at a time, then add the ground almonds, vanilla and a pinch of salt, briefly beating in the flour to finish. Spoon into the pastry case, smoothing the surface. 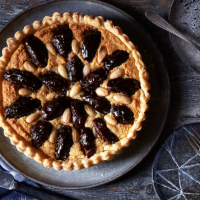 Using a slotted spoon (and reserving the syrup), transfer the dates one by one to the frangipane, arranging them in concentric circles and slightly pushing them into the surface. Arrange the almonds in between the dates. 4. Bake for 50-55 minutes, or until the frangipane is golden, risen and firm in the centre. Release the pastry at the edges, then leave to cool in the tin for at least 20 minutes before removing. Drizzle the top with the reserved date-bourbon syrup and serve warm or at room temperature, with crème fraîche, if liked.